Dr. Sarah Thompson is proud to be a leading provider of clear braces to the residents of O'Fallon and the surrounding St. Louis areas. 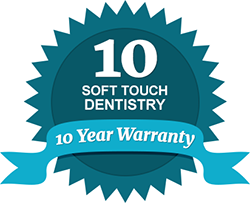 Soft Touch Dentistry offers ClearCorrect, an invisible orthodontic solution that can beautifully straighten your smile, with the convenience and discretion you desire. Our practice serves patients of all ages with top quality preventative, restorative and cosmetic dentistry. We have a dedicated team of dental professionals who are passionate about helping you achieve your best smile. Whether you need a routine cleaning, restorative dental care or a breakthrough orthodontic solution such as Clear Correct, we will serve you in the comfort of our caring, stress-free environment. ClearCorrect uses a series of custom clear dental aligners to slowly move your teeth into ideal position. This discreet smile correction treatment involves four phases of aligner therapy, with each phase requiring a new set of aligners for a three-week period. The time between each phase allows for control and flexibility. Our patients find that ClearCorrect not only allows them to have an invisible treatment process, but it is also more comfortable and convenient than traditional braces. Although the aligners should be worn all the time, they can be easily removed for eating, drinking, brushing and flossing. Contact Soft Touch Dentistry today to learn if you are a candidate for clear braces such as Invisalign or ClearCorrect. Dr. Thompson is dedicated to addressing your specific smile concerns using the latest, most advanced dental technology. We can combine your clear braces treatment with teeth whitening or other cosmetic dental services to help you achieve that smile you have always wanted. Our office accepts most dental insurance carriers and we offer flexible payment options and financing plans for your convenience. We look forward to caring for your smile in every way possible.